I took this on my first bike ride through Oaks Bottom Wildlife Refuge on the Springwater Trail. 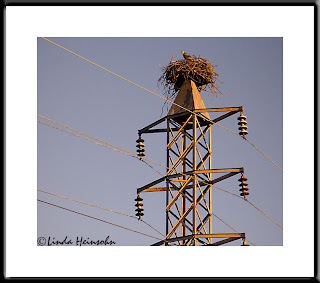 It was near mid-summer and the prolonged sunset was giving the tower and the bird's nest a very warm glow. Luckily, a bird popped head's up just as I was going to take my shot! I have no idea what kind of bird it is. Thanks Carol! I noticed after taking this shot, there are platforms on the towers--every other one--in this refuge. Probably to encourage Osprey nesting.